An excellent way to start building your child’s vocabulary is by having her relate past experiences and discussing them with her. 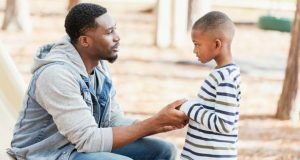 Research has shown that caregivers can build children’s narrative (storytelling and sequencing) skills by asking the child to talk about her day. It is as simple as saying “What did you do at preschool today?” or “Tell me about your time with Grandma and Grandpa.” If the child doesn’t respond much, try to follow through with details. “I know Grandpa took you to Pixie Land. What was your favorite ride?” “Did you play with Caulder at Discovery Tree today? Did you guys play in the sandbox or ride the tricycles? 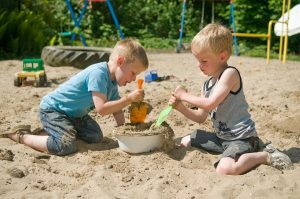 Who played in the sandbox with you?” Research has shown that something as simple as talking with your child about what she did during her day builds vocabulary and narrative skills, which are so important to success in school. For preschoolers, help children see how ideas and objects relate to each other. Use words such as similar, alike, opposite, different, etc. You can also introduce categories such as fruits, vegetables, furniture, transportation. Teaching categories will be very helpful for kindergarten. Introduce the alphabet, numbers, colors, and shapes. Ask more why questions that help children think through and problem-solve. Read books with children and discuss the stories and pictures. Make books with pictures that children draw or that you cut out of magazines or get from the internet. Encourage the child to create a story that you write down. My son Mark and I used to “write books;” it was so much fun. I’d staple pieces of paper together, and he would draw pictures on each page and tell me the story. I would write down his words, and at the end, we would read his story together. He loved this, and it was an entertaining and very easy way to build his pre-literacy skills and enhance his vocabulary. If your child shows a special interest in a topic, introduce new vocabulary around the topic. Remember to emphasize new words a little more loudly and repeat them over and over. 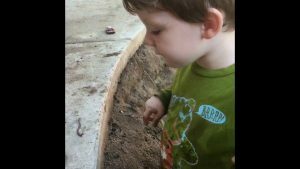 For example, my niece’s 2-year old son Landon loves worms. When I was visiting \some time ago, we dug around with his plastic shovel while he crawled in the dirt and Aunt Celeste spent a lot of time hunched down beside him! I’d say things like ‘Look, Landon, you have your shovel! The shovel is green (pointing) and yellow (pointing). Uh oh, now you are pouring dirt on your blue truck. The blue truck is all gone! It’s under the dirt. Under the dirt.” “Landon, you put your blue truck under the yellow cup (pointing) Here’s the yellow cup. Does it have worms in it? Not yet!” Landon and I had so much fun! I was able to enter into his play and incorporate new vocabulary words by using objects and activities that he was naturally interested in. In early childhood, it is much easier to teach children nouns (e.g., worm, truck, shovel) than adjectives (e.g., dirty, clean, sticky) and verbs (e.g., pour, stack, run, eat). As caregivers, we can be patient as children learn nouns (persons, places, or things) much more readily than adjectives (descriptive words) and verbs (action words). Adjectives and verbs will come with time and repetition. For young children, nouns are earliest form of speech to develop—and they are the building blocks of language!